Maximum effectiveness anti-UVB and the incomparable performance anti-UVA of Photoderm MAX Ultra Fluid protects safely against sunburn, prevents sun intolerance reactions and combats premature skin aging. Ultra lightweight texture of Photoderm MAX Ultra Fluid leaves the skin a sensation of extreme softness. Photoderm MAX Fluid spreads easily, leaving no oily or white markings. Photoderm Max spf50 +, Ultra-Fluid: Fluid texture, without color when applied, does not leave the skin with oily or with white markings. A major breakthrough against the risk of damage to skin cells, their exclusive patent BIO Cell protection ® (patent Bioderma) provides an optimized protection for skin cells. 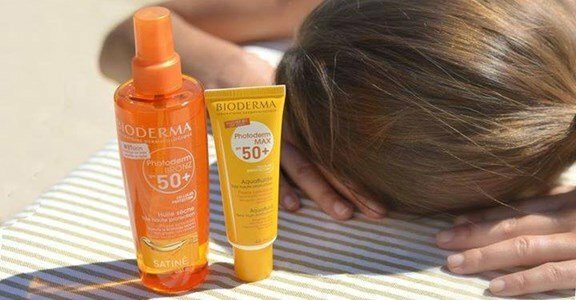 The photoprotective care of Photoderm from Bioderma ensures optimal sun protection and prevents intolerant reactions in the sun. Directly protect skin cells from the sun's dangers: patented cell complex Bioprotection Celular. Has no fragrance and ensures an excellent tolerance. What type of sun protector do you need? What is your skin type? Find out which sun protector will be the best for your skin.